Do the Nets have an April surprise for the Bulls? Is Charles C.J. Watson the fulcrum in this Bulls/Nets series? No, not because Joe Johnson also has plantar fasciitis and is a game-time decision for Thursday’s pivotal (they all are, but we like to say it, anyway) Game 3 of this first round series now tied 1-1. Though if Johnson can’t play, Watson likely would move into the starting lineup. Plantar fasciitis seems more contagious these days than avian flu. Isn’t there a vaccine? Meanwhile, the fear Watson factor is also not necessarily because the former Bulls backup point guard has been tangling with the current Bulls backup point guard, Nate Robinson. Watson has been the Nets’ best reserve, averaging 12 points on impressive 58 percent shooting. Though in some respects he’s been the most troublesome Net for the Bulls. I’m not a big fan of that plus/minus stat, but Watson is the only Nets’ player to have a plus rating (team scores more points when he is on the floor) in both games. But more than that, it’s the problems the Nets pose when Watson is in the game. The Bulls controlled Watson well in the four regular season games when he averaged 4.5 points against the Bulls and shot just 35.3 percent. That helped account for the 3-1 edge. Watson has gotten loose in this series, though only partly because he’s played mostly against Nate Robinson, who isn’t a particularly adept defender. The Bulls came back impressively in Game 2 against the Nets with a strong defensive game highlighted by a pair of relatively minor adjustments. By the way, those playoff adjustments talked about so much tend to be somewhat overrated. After all, when the champion Bulls had a poor scoring game they didn’t abandon the triangle offense. And Bulls coach Tom Thibodeau doesn’t change defensive principles that have been so effective the last three seasons. 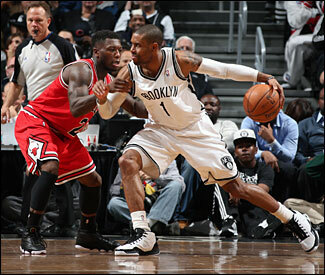 So the Bulls did what seemed the obvious after the Nets 106-89 Game 1 victory. Other than deciding they wanted to seriously compete in Game 2, of course. The Nets had 56 inside points in that game, 40 by halftime when the game effectively was over. So the Bulls squeezed the middle a bit more. Sure, Brook Lopez can make jump shots. Let him. He made four straight in the second quarter of Game 2. Fine. It’s not hockey. Teams score. It’s about giving them the baskets that will hurt least: Fewer threes and layups or dunks. So the Bulls did a better job inviting the Nets outside, and they also put more effort into helping on Deron Williams. Not double teaming. The Bulls don’t do that much since one of Thibodeau’s most vital rules is you get back to your man. You can stunt, which is to come over and help. But you must recover, the latter more important than the former. The Bulls stayed with the stunt perhaps a little longer than usual because Williams is so important to what the Nets do. But they also closed on the shooters. The Bulls are OK if you step in and make that jumper. As long as they get you off the three-point line. That’s why the Bulls defense is so good. Because it requires that level of effort. But it requires players who will carry that out, and the Bulls have those guys with Thibodeau’s urging. It’s no secret. They just try harder than most. Williams was one of nine shooting in Game 2, which will change no matter what the Bulls do. Williams is too good, and he’ll be determined to produce better numbers. Like Thibodeau said at Bulls practice Wednesday, everyone expects Johnson to play in Game 3. I doubt Nets coach P.J. Carlesimo would try — though he almost always does to finish games — the three guard lineup to start? It’s become somewhat fashionable in these playoffs, if not in the NBA as a whole. I’m not sure what all the positions are with the Miami Heat, but I know there is no center. The Warriors put on an offensive clinic against the Nuggets Tuesday starting three guards, and the Rockets almost pulled one out Wednesday against the Thunder as they started three guards. Obviously, Lopez has been an important player for the Nets. And though he doesn’t score, Reggie Evans gives the Nets rare toughness at power forward and makes up for some of the rebounding Lopez doesn’t care for. But you wonder if the Nets would bench Gerald Wallace, who after what was an untypically good game in Game 1 reverted to one of seven shooting for two points in Game 2 and sat out the fourth quarter. That may have been the tipoff. When the Nets needed to make a move they wouldn’t play Wallace. You’d think the way the Bulls are defending, what the Nets might try to do is spread the court with more shooting to try to bring the Bulls out more, both out of the lane and where they are attempting to box in Williams. That would be where Watson comes in. He was the Nets’ best three point shooter this season at 41.1 percent. Trying to make a comeback in Game 2, the Nets went almost the entire fourth quarter with Watson and Andray Blatche. Though Blatche takes some wild shots and seemingly was one of the few Nets players who didn’t get a game plan, he can be a scorer whom you have to defend. That certainly doesn’t apply to Evans, and barely to Wallace, the latter the only one among the Nets’ top nine scorers to shoot below 40 percent and 13.5 percent on threes after the All-Star break. The lack of that shooting threat enables the Bulls to clog the lane much more effectively. Though is Carlesimo willing to drop one of his high salaried, high level starters? Chemistry is also vital at this time and Wallace basically started every game he was healthy. How desperate are the Nets given it’s still just 1-1? If the Nets go more extensively with Watson it would seem to be difficult to defend him with Robinson, who is 12 of 23 and averaging 14 points off the bench, though 11 points were in the fourth quarter of the Game 1 blowout. I’m not sure what their clashes are about, though Robinson never stops talking in games and you never know for sure what he will say. Nor, seemingly, does he. But Watson has seemed to be the former Bulls reserve among all those let go the last two years who harbors some resentment. Perhaps it’s just that everyone else was replaced by a player taller than 5-7. It seems Watson has played with an edge the first two games. Quiet storm, as his nickname goes, I guess. I thought one of the more effective Bulls in Game 2 was Marco Belinelli, who had eight points in just 11 minutes. He didn’t stay in long after a good second quarter run of shots as Thibodeau appeared to be trying to match Robinson with Watson. Jimmy Butler has been something of a reluctant shooter. He’s six of 12 in the two games, though he attempted just four shots in Game 2. He’s not your classic shooting guard, more in the game for defense against Johnson. So the Bulls don’t generally run their shooting plays for him as they do for Belinelli and Richard Hamilton and Kyle Korver last season. And Belinelli is an excellent pick and roll player. If Watson is in the game more perhaps Belinelli could defend him, though Butler obviously would be better. But assuming Johnson is healthy enough to play — and it’s not that he runs around a lot as he’s mostly a spot shooter these days perhaps because of his foot — the Nets might come back at the Bulls with that smaller lineup and ball movement to try to loosen up the middle and provide better lanes for Williams. Of course, then the Bulls could stay big and try to take advantage as the Nets do worry about the rebounding and second shot disadvantage. I also don’t expect to see much of Kris Humphries as he’s another non scorer. Carlesimo has liked to play big this season, but the edge his team would seem to have is athleticism and their late season scoring surge from opening the court. It’s where Boozer could provide a counter as he’s 18 of 32 shooting in the series, averaging 19 points and 10 rebounds. Yes, Joakim Noah likely will play his 20 to 25 minutes, and his effort was fabulous in Game 2, though primarily to close the game. Though a lot may depend on how much the Bulls see C.J., and how often they can keep him from seeing the basket.